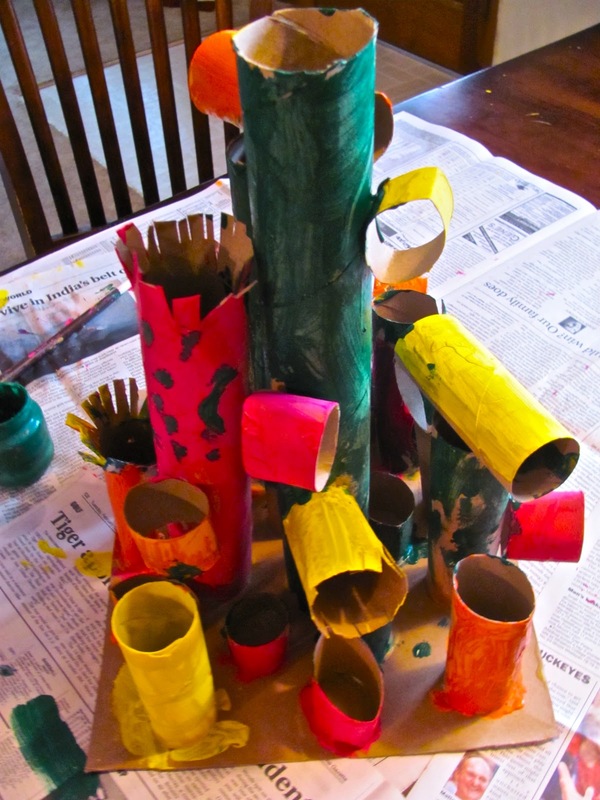 The Chocolate Muffin Tree: 8 Recycled Projects For Earth Day! Earth Day is coming soon on April 22nd!!! 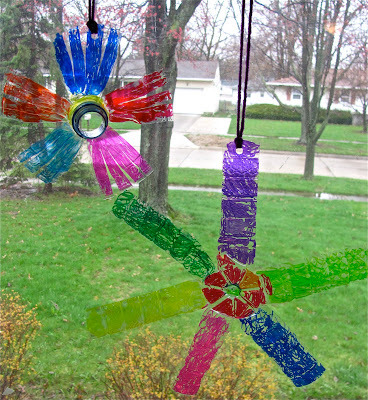 Do you need some Recycled project ideas? Making a Recycled project is a Great way to celebrate Earth Day!! I have a great collection of "Earth Friendly" projects so far so far. Check them out! Click on the name for the directions. I'm sure I will come up with some "New" Earth Friendly projects, but here are some to get you started in time for Earth Day! I Love Recycled projects as you can see!! Cassie Loves to help me pick up trash around the neighborhood which is another wonderful way to celebrate Earth Day! "Mom, we need to pick up trash to take care of the Earth!!" WHAT ARE YOU DOING TO CELEBRATE EARTH DAY WITH YOUR CHILDREN??? Every day should be Earth Day, but do something special to celebrate! We will definitely do somethings! You do have such very wonderful ideas for using recycled items. One thing I like doing, and just finished last week - is decorating the top half of pop bottles with tissue paper, and hanging them from the ceiling, they create suncatchers, and are quite pretty. I'll try to take photos and post soon. I love that Cassie cares about the environment! Just want to thank you for your lovely comment on my blog, I value your dropping in and your thoughts! Thank you for sharing these great ideas. Love the little Activia containers at the front of the truck. all wonderful projects, thanks so much for sharing on Craft Schooling Sunday! I love your collection of recyclables :) Thanks for sharing (and supporting) It's Playtime again :) We really appreciate it! Great ideas! 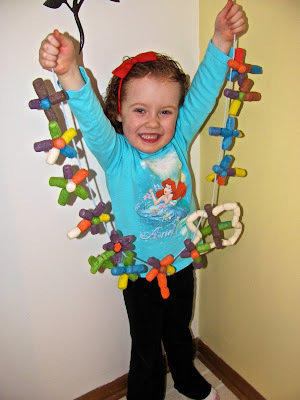 Love reusing stuff in our crafting and creating. I love all the ideas here! Despite having some project ideas in my head for Earth Day, I'm going to save them for next year. Since Good Friday and Earth Day fall on the same day this year, I've decided we'll focus on Easter in the week ahead. Then we'll celebrate Arbor Day the last week of April. We did do an Earth Day craft at our local Michael's store today. My girls painted their own eco-friendly totes. Excellent! I will promote this now so that we catch Earth Day! We just made a batch of musical instruments with recycled containers and filled with rice, chopsticks for drumsticks! Lowe's is giving away free saplings on Saturday so well be getting one and planting. I featured this posting on my page at It's Playtime this week. I have a special "featured" button if you want to use it. Thanks for sharing this activity with us last week! Those are great ideas! 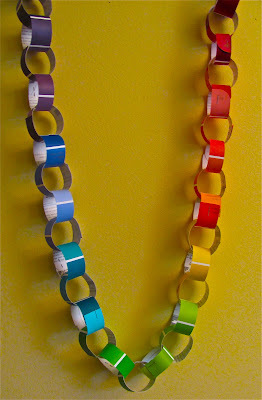 I love the paint chip collage and chains. I just saw some awesome paint chips at Home Depot that are shaped in the shape of a flower petal. I grabbed a handful but haven't figured out a craft for them yet!